As Adhesives become more and more complex, handling of these adhesives will keep on getting more difficult. For any expert user of such adhesives it should therefore of utmost importance to keep up to date with available options in dosing technology. Germany’s ViscoTec Pumpen- u. Dosiertechnik GmbH is a perfect partner, that can bring to the table a good basis of knowledge on the subject of dosing technologies and help in discussing on how to approach a new project. With the preeflow product range ViscoTec offers a wide range of options for many years now have helped pump and dose low to high viscosity liquids. These pens and their controls have been a great success story! Based on the ViscoTec endless piston principle the products is handled very gentle. Liquids loaded with solids and shear sensitive adhesives can be dosed very precisely and free of bubbles. The special bonding of materials inside the pump and the wetted components prevents adhesives from reacting and hardening. The growing demands for dosing in ever smaller quantities without sacrificing precision can by realized with the eco-PEN 300. 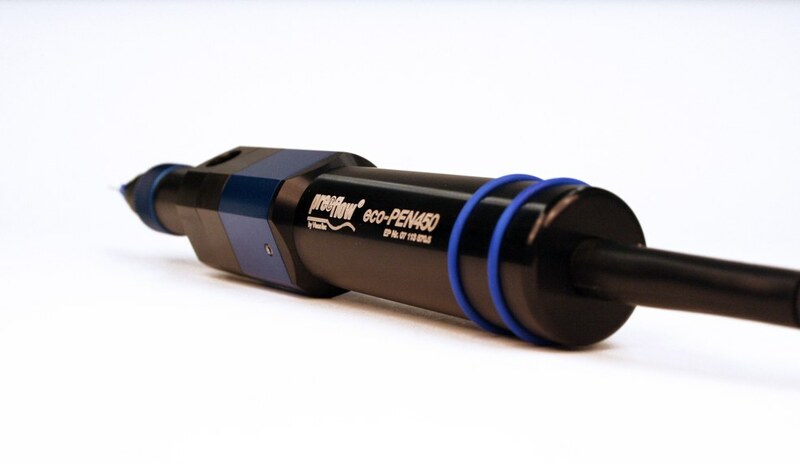 With the eco-PEN 300 dosing quantities from 1 microliter on up with an accuracy of +/- 1% can be realized without difficulty.